Using a photo is always a risky design option. This pictures the White Cliffs of Dover with a Spitfire flying above, which is a familiar Kentish sight and provokes Second World War imagery. A bowl of Crisps is poking out of the side. 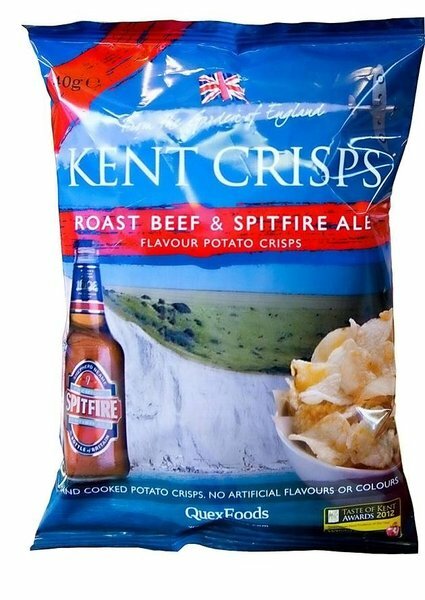 It does the job of persuading consumers of the delights of Kent, but does nothing to build a brand or sell Crisps. It could just as easily be for any foodstuff. These Crisps had a high amount of oil stiffening running through them. This provided each Crisp with a solid foundation from which it passed on a really hard, brittle and crunchy munch. These Kettle Cooked style Crisps were thick and meaty looking. Their were oil boils and a crackly crispy surface. The shapes were all over the place - there were flat ones, bendy ones and some folded into pieces. There was skin on edges, but the most characterful aspect of all; they were brown! The seasoning was literally lathered on. A Nose Plunge Test revealed a heavy smell of beef stock. Like an Oxo cube before crumbling. I know none of you will know what I am talking about, but they tasted like a lamb shanks recipe we cook at home. There is stock, there is wine. There are lots of herbs and other stuff. How this translates to these Crisps is clearly a heavy stock to represent the beef and certainly some alcohol. Not necessarily Spitfire Ale, which is a bitter. These Crisps had a really interesting and enjoyable flavour, even it is hard to pin down the flavour as a bag description match.